Richard Collins, author of The House of the Seasons and Cheryl MacLennan, author of Historic Homes of Jefferson will be speaking at the Jefferson Carnegie Library at 7:00 p.m. on Thursday, February 16, 2012. The public is invited to attend, free of charge. Complimentary dessert and beverages will be offered. Come meet the authors and learn more about these two books featuring local Jefferson historical landmarks. Cheryl MacLennan is a Texas native and has been practicing photography for more than 25 years. John Scheyd of Pelican Publishing says “Her enthusiasm for history, architecture and culture serves as inspiration for her work. Historic Homes of Jefferson features the finest landmarks of Jefferson. Through stunning photography, MacLennan captures the architectural details of more than 25 historic homes and buildings, built between the years of 1850 and 1880”. This event will take place in the upstairs ballroom at the Jefferson Carnegie Library. Many Americans first entered the worlds of information and imagination offered by reading when they walked through the front doors of a Carnegie library. One of 19th-century industrialist Andrew Carnegie’s many philanthropies, these libraries entertained and educated millions. Between 1886 and 1919, Carnegie’s donations of more than $40 million paid for 1,679 new library buildings in communities large and small across America. 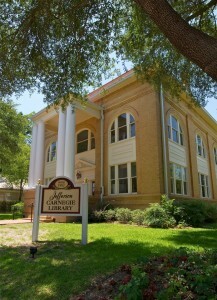 Jefferson’s library, built in 1907, is one of only five Carnegie Libraries serving its original function in Texas today. The Original Greek Revival architecture of the library was awarded a Texas Historical Commission plaque and a National Trust Register of Historical Places plaque. Operating as a non-profit organization, the library board is committed to the preservation, maintenance and full usage of this historic landmark. This entry was posted on Monday, February 6th, 2012 at 2:09 pm and is filed under Book Signing, Jefferson Texas, The Carriage House Bed and Breakfast. You can follow any responses to this entry through the RSS 2.0 feed. Both comments and pings are currently closed.